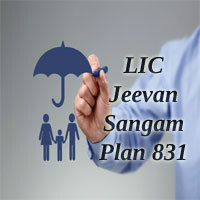 LIC Jeevan Sangam Plan is a non-linked, with profit, single premium plan that provides for a high level of death cover during the policy term. Under this plan no. 831, the insured will have the option to choose the Maturity Sum Assured. The single premium payable depends on upon the selected amount of Maturity Sum Assured, and also the age of the life assured. LIC’s Jeevan Sangam was introduced on 3rd March 2015 by the Life Insurance Corporation, which will be open for 90 days from 4th March 2015. The Jeevan Sangam Policy is an unusual combination that provides investment opportunity with high-risk coverage feature and regular income for life time. It is a close ended plan, and the Unique Identification Number (UIN) of LIC Jeevan Sangam Policy 831 is 512N295V01. This UIN should be used in all relevant documents provided to the policyholders. The Key features, Eligibility Conditions, Benefits, Rebates, etc. of LIC’s New Jeevan Sangam Policy are mentioned in detail below. Refer our site www.policybook.in for more information regarding LIC Endowment Plans. What are the Features of LIC Plan No. 831? High Risk cover in case of Death. Option to choose the Maturity Sum Assured. Any time surrender option & higher surrender value. Premium paid is eligible for the rebate under 80(C). Maturity amount will be tax-free under Section 10(10D). The Benefits of LIC Jeevan Sangam Endowment Plan are mentioned below. If the insured dies before the date of commencement of risk, the single premium will be refunded without interest and service tax, and extra premium will be excluded. If the Policyholder dies after the date of commencement of risk, Basic Sum assured, i.e., ten times the tabular single premium shall be payable. Basic Sum Assured, i.e., ten times the tabular single premium along with Loyalty Addition, and if any, shall be payable. NOTE: The Tabular Single premium does not include any extra premium or taxes and is before applying any rebate. If the Life Assured survives till the end of the policy term, the Maturity Sum Assured along with the Loyalty Addition will be payable. LIC Endowment Plan 831 was eligible for the share in profits in the form of Loyalty Addition, which depends on upon the experience of the Corporation. The Loyalty Addition shall be payable on death or surrender, provided the policy has run for at least five policy years or on policyholder surviving to the maturity. The Policyholder may return the policy to the corporation within 15 days if he/ she was not satisfied with the Terms and Conditions. The count should be from the date of receipt of the plan. The Policy completed under Corporation Employees Insurance Scheme will be eligible for the CEIS Rebate of 2% of the tabular premium. But the policy should not be taken from any Intermediaries such as Agents/ Direct Sales Executives/ Brokers, etc. Commission to Agents, Corporate Agents and Brokers is payable at 2% of the Single Premium received. Credit to Development Officers will be at 5% of the Single Premium. No Bonus Commission will be payable. LIC Jeevan Sangam Policy Calculator is used to calculate the Premium amount that has to be paid to get all the benefits available under this policy. The data required for calculating premium rates using LIC’s Jeevan Sangam Maturity Calculator are Name, Email-Id, Age, Term, Sum Assured, etc. Since the mode of payment for this policy is available in single premium only, you can calculate your maturity amount and bonus for the single premium mode. The major drawback why a lot of people stayed away from LIC Policies is because of their high price. When compared with the endowment plans available with other insurers in India, insured think that these are costly. But few still tried to buy this LIC Jeevan Sangam Endowment plans with LIC because of their faith in it and to diversify their risk among the insurers. The Buying procedure of LIC Jeevan Sangam policy is very simple if you have all the information regarding documents with you. The Life Assured can buy the LIC Plan 831 either in online or offline mode. In Online mode, the insured have to visit the LIC Direct Website and fill the application form or proposal form for the relevant policy. The guidelines regarding how to fill the form and required documents are mentioned in detail there. In Offline mode, you have to approach the LIC agents or intermediaries and pay the premium by Cash/ Cheque/ Demand Draft at the cash counter of any LIC Branch Office. Before buying the policy, you have to keep the following documents with you. If Required any Medical Certificates, etc. The Applicant should submit the following documents while claiming the Jeevan Sangam Plan No 831. Medical treatment documents before death. The Loan facility is available for the policyholders at any time during the policy term after three months of the policy issuance. The following conditions will be followed while issuing the loan. NOTE: *3 months means loan can be availed after three months of the policy issuance. b. The Corporation shall become entitled to deduct the amount of the loan or any portion thereof which is outstanding, together with all outstanding interest from the policy money, if the policy matures or becomes a claim by way of death. During the policy term, the Policy can be surrendered at any time. First Year – 70% of single premium paid excluding service tax and extra premium paid. Thereafter – 90% of single premium paid excluding service tax and extra premium paid. Special Surrender Value will be the discounted value of the Maturity Sum Assured. The special surrender value factors per Rs 100 of maturity sum assured for 1/2 year, 1 year, and 1 1/2 year are given in the table below. If the policy is surrendered after completion of five policy years, the Loyalty Addition based on the surrender value may also be payable. Back-Dating Interest: The policies can be dated back to the same financial year. The Back-dating interest will be charged at the rate as fixed by the Corporation from time to time at the time of completion of policy. Policy Stamping: 20 paise per thousand of Basic Sum assured will be the Charges for policy stamping under this plan. Assignments/ Nominations: Assignments or Nominations for Plan 831 should be made at the proposal stage as per Section 39 of Insurance Act, 1938. Proposal Forms: Proposal Form no. 300 and 340 issued by the U&R Department as applicable should be used for this LIC Jeevan Sangam plan. Taxes: The amount of tax payable by the policyholder on single premium including extra premiums, if any shall be payable. The amount of tax paid shall not be considered for the calculation of benefits payable under the plan. The Policy will lapse if the insured commits suicide within one year from the date of commencement of risk or the date of revival. An amount which is higher of 90% of the single premium or surrender value shall be paid. But this clause shall not be applicable in the case of the policyholder whose age at the time of entry is below eight years. 1. How much will be the Commission paid to the Agents or Intermediaries? A. The Commission to Agents/ Corporate Agents/ Brokers is payable at the rate of 2% of the single premium received (net of taxes). 2. What does Sum Assured mean? A. Sum Assured is the amount of money guaranteed to be paid on Policy Maturity and also the amount of life cover for which the policyholder is being insured.